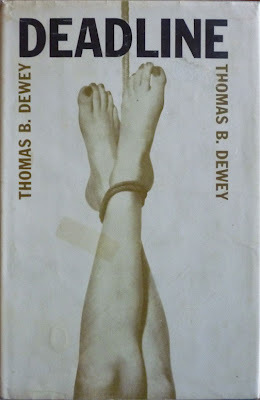 It's the UK hardback first edition of Thomas B. Dewey's Deadline, published by T.V. Boardman in 1967 (originally published in the States by Simon & Schuster in 1966). 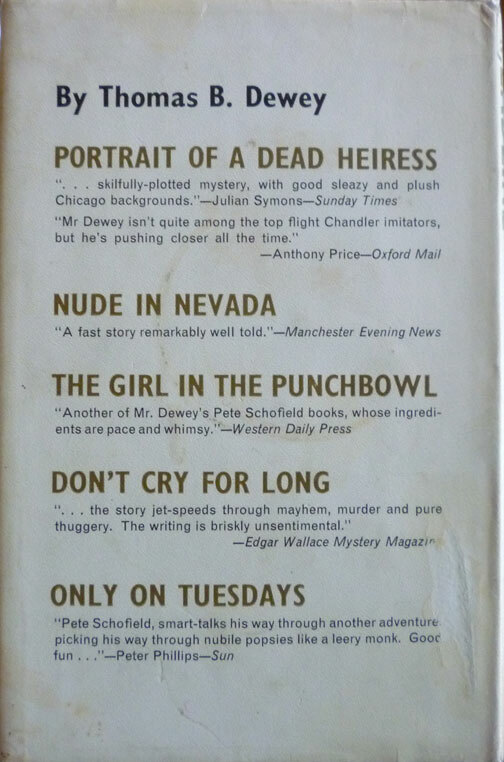 An American author of hard-boiled crime fiction, Dewey isn't widely remembered today, but he wrote around forty novels over the course of his career, comprising two series and a bunch of standalone works. One of those series stars a private eye named Pete Schofield; the Rough Edges blog has a post on that series here. 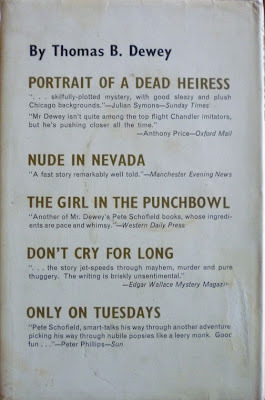 The other series features another P.I., simply called Mac; the Vintage Hardboiled Reads blog has a post about that series, to which Deadline belongs, here. But for a more complete guide to Dewey, allow me to send you to this Killer Covers essay, which contains all sorts of titbits about the man, and which saves me the effort of doing any more of my own research. Thank you, Killer Covers blog. God I love the internet. Peter Davidian sits in the state prison, awaiting execution for the mutilation murder of a young small-town girl. Because of the horrifying nature of the crime all appeals have failed. Mac, the Chicago private eye, is hired by a group of do-gooders in a last desperate effort to save the boy from the chair. He goes to the small town where he finds no clues, no leads, no help. What he does find is a hostile town, a town that wants blood. T.V. Boardman didn't publish all of the Mac novels in the UK, but they did publish a good number of them (along with other Dewey novels), all with dustjackets designed by the great Denis McLoughlin, who's cropped up a few times on Existential Ennui. His cover for Deadline is one of the more provocative of his I've seen, and unusually is essentially photographic in nature; McLoughlin did sometimes incorporate photographs into his illustrations, as with his jacket for Donald E. Westlake's The Busy Body, but I've never come across one that's basically just a photo with type. By the looks of it the photo of the girl's strung-up legs was clipped from another source then pasted into the design. Wonder where it came from originally...?